Cass Sunstein’s #Republic: Divided Democracy in the Age of Social Media is very timely, as we all, horrified, watch the American republic splinter ever more irreparably since the election last November. 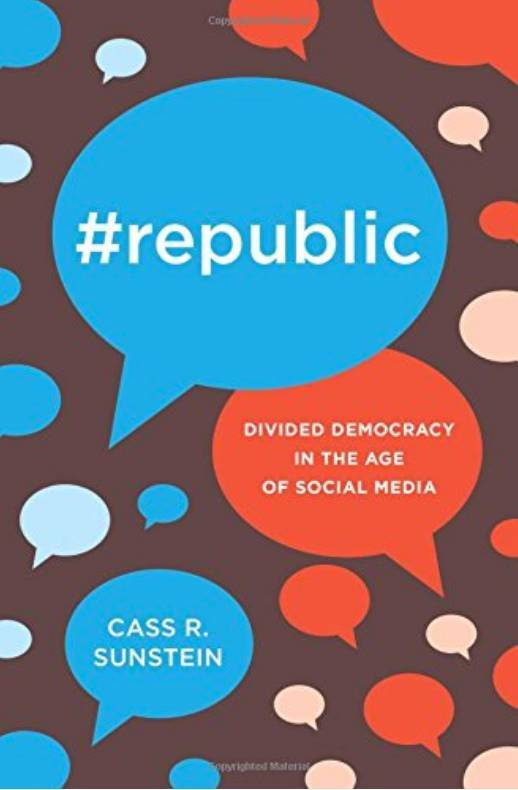 The book links the literature on filter bubbles and social media dynamics with the actual political impact in the US context, and the constitutional implications. It cites the growing empirical literature on political polarisation as a result of the spread and increasing use of social media, especially Facebook. (Of course, conventional media have contributed to the polarisation as well – there are some empirical studies such as this one.) Some of the figures Sunstein cites are startling, such as the polling showing that both Republicans and Democrats have growing increasingly likely to express “displeasure” if their child were to marry someone with the opposite political affiliation (49% and 33% respectively in 2010, up from 5% and 4% in 1960, presumably higher still now). This far exceeds the “displeasure” expressed about inter-racial relationships. Much of the book concerns the scope for deliberative democracy, or getting people to talk to each other and talk through problems. Technology could in principle enable this, although it currently does the opposite. At the same time, the other occasions on which we would all ‘meet’ different kinds of people, from different classes and races, and different opinions, have shrunk. There is more social sorting in real life. The conventional broadcast media are being displaced, and narrower themselves. (Not to mention now being under attack by Trump and Bannon.) Sunstein isn’t too starry eyed about democracy, though: “For many political questions, what matters is getting the facts straight, and for that you need experts, not deliberative opinion polls.” Hooray! Communications and the media are exceptionally important in a democracy (cf Amartya Sen) and are at the epicentre of the current maelstrom of populism. I was interested in Sunstein’s emphasis on the importance of media ‘solidarity goods’, a special form of merit good that promotes social interaction, debate, understanding, a sense of shared citizenship and solidarity. He suggests solidarity goods are essential to build social capital. The book resists the temptation to offer quick fixes – there aren’t any. Instead it underlines the priciples of any measures that might make things better: exposing people to material and ideas they wouldn’t otherwise choose or experience; ensuring citizens have a range of common experiences; ensuring policy debates have substance – ‘expertise’. It’s clear to me there are some sharp questions about the regulatory framework governing social media and the online world in general, questions regulators have been pretty keen to avoid so far. It’s time for them to do so now.